The late Richard (Rich) Smith of Paraiso Vineyards and Smith Family Wines in the Santa Lucia Highlands of California was first and foremost a family man, and also a successful grape grower, winery owner and respected colleague. Before his passing in 2015, through his significant and selfless contributions of time, energy and funds to organizations that advance the American grape and wine industry, he came to be known as a highly effective, collegial and tireless leader. 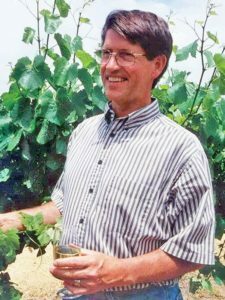 Three of those organizations–the National Grape Research Alliance, WineAmerica and the Winegrape Growers of America–together with the Smith Family, collaborated to create the Rich Smith Distinguished Service Award to honor his spirit and legacy. The award recognizes people who demonstrate similar qualities and make a similarly positive impact on the industry, such as past recipients John Martini (Anthony Road Wine Co.) and Pete Downs (Family Winemakers of California). Nominations for this year’s award are now open for this year’s winner. Click to the award criteria and simple nomination form and make your nomination(s) by October 26, 2018. We look forward to recognizing another industry leader as we honor the memory of Rich Smith.